The VintageMachinery.org archive as of this writing (November 20, 2006) lists nine (9) four footed cast iron, cast iron wheeled band saws. C. B. Rogers & Co. Eight are represented by archival photographic entries in various degrees of completeness. The D. C. Allen saw does not have a photographic entry. Of the eight with photographic entries all are of cast iron frame construction. Two of these have rounded cored ‘necks’ and necks separate from-and bolted on the-bed sections. These are the Welch, Harrison and the Welch & Chipman. The Rogers saw has a rounded cored neck cast integrally with the bed section. Of the other five, four are Pryibil related, two being First & Pryibil and the other two being Pryibil. All these four have rectangular sectioned cored necks cast in one piece, integrally, with the beds. The last example is the Collins & Greenwood saw which has a rectangular flanged bed. All eight pictured examples have legs bolted to the beds. All eight of these saws have cast iron wheels. Patent dates are recorded as being cast into six of these eight saws. Neither the Collins and Greenwood saw or the Rogers saw has a record of a patent. Indeed, the C.B. Rogers company—active from around 1841 to 1897- held no patents on band saws. 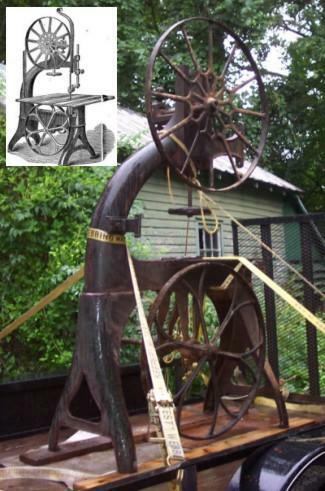 The Collins and Greenwood firm did patent, on August 12, 1873, a design for a band saw frame. Therefore three of the Pryibil examples date would seem to date 1873 or after at the earliest and one in 1876 or after at the earliest. It is not perfectly clear when these nine four footed cast iron saws with cast iron wheels were made. It is clear that earliest Pryibil related saws could not have been made before 1873 and the earliest Welch related saws could not have been made before 1868. Three is no patent evidence for dating the one example of the Rogers saw. The D. C. Allen saw, though not illustrated, is described as having a patent date of May 26, 1874. Therefore this saw could not have been manufactured prior to that time. It is possible that the ascription of the patent date of 1876 for the 'Woodshave' example of the First & Pryibil is mistaken, as a search of patent records does not indicate any 1876 patents likely to have been used on that saw. It is possible that ‘1876’ is a mis-reading for another date, possibly ‘1866’ or ‘1873,’ both of which dates present the possibility of one digit errors and both of which dates also had Pryibil band saw related patents. It is, of course, also possible that machines could have been produced before the patents were granted but, based on the claim of patent dates this does not appear to have been the case with any of these seven saws. It may or may not be instructive that four of the nine saws of this type with archival records as of this date are related to the New York firms associated with Paul Pryibil. The geographical distribution of these saws is quite limited, six out of nine coming from two large cities, the other three from small New England locales, all nine produced within a limited range of area. Since four of the examples of this type of band saw are associated with the Pryibil firms in New York City and two others with the Welch firms in South Boston, only two enterprises — in the two largest cities of the sample - account for two-thirds of the archived band saws of this type. 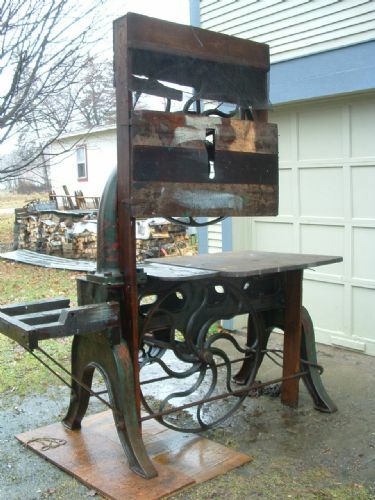 The VintageMachinery.org archive as of this writing (November 20, 2006) lists thirteen (13) band saws thought to be relatively early produced examples that are not four footed, and are cast iron and, in general do not have fully cast iron wheels. All thirteen are represented by archival photographic entries in various degrees of completeness. All of these saws are of cast iron frame construction. All of these saws are of the C-frame style of design. 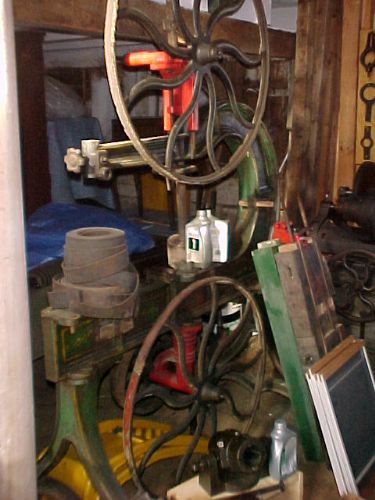 All five Atlantic Works saws are of the ‘cored frame’ variety as are both examples of the L. Power & Co. and the single example of Baxter D. Whitney. Two of the three J.A. Fay& Co. saws are of this type, with the third example being of the ‘flanged frame’ type. The two Goodell & Waters represent one of each type. Therefore eleven of the thirteen early not four footed, cast iron with mostly non cast iron wheels saws are of the ‘cored frame’ variety of the C-frame style of design and two of these thirteen saws are of the ‘flanged frame’ type of the C-frame style of design. One saw only—the Baxter D. Whitney saw—has fully cast iron wheels. All other twelve saws have wheels made of other materials in whole or in part. It is likely that some of the saws without records of patent marks may actually have these marks, which can not be determined at this writing. While neither of the L. Power saws have recorded marks L. Power & Co. did hold one 1885 patent for band saws. Likewise though the Baxter D. Whitney saw has no record of a patent mark this company held four band saw patents dating from 1872 to 1875. In the case of the Goodell & Waters saw the patent is said to be from 1882 though the company held no band saw patent with that date and did hold one each in 1883 and 1884. Three of the Atlantic Works saws have recorded patent marks while two do not. It seems instructive that of these thirteen presently archived non four footed, cast iron with non-cast iron wheels band saws the geographical distribution of the manufacturers of the saws is quite different from the earlier sample of the nine presently archived four footed cast iron, cast iron wheeled band saws. Whereas the earlier group were all from New England and New York, and three out of nine were produced in relatively small New England cities (of Lebanon and Concord, New Hampshire and Norwich, Connecticut,) most of this group of thirteen saws—nine out of thirteen—were manufactured in Philadelphia (within a few city blocks of one another, as it turns out)—three in Cincinnati—a further western city than any of the first type studied—and only one (the Baxter Whitney saw—which is also the only one with an all cast iron wheel, in appearance very similar to the wheels of the other type studied) from a small New England city. None of saws of the previous study had come from the sizable cities of Philadelphia and Cincinnati, which here together counted for twelve of thirteen. Two of these firms (J.A. Fay & Co. & Baxter D. Whitney) were in business—in the 1830’s - well before the development of the band saw as we are studying it. The other three were founded—1867 to 1873 or 1874 - at precisely the time of the band saw development we are studying. The early two, when founded, were both New England firms from relatively small cities (the progenitors of J.A. Fay & Co. in Keene and South Keene, New Hampshire) and the Baxter D. Whitney firm in Winchendon, Massachusetts while all the remaining three firms—all established in the handful of years around 1870—were all in Philadelphia, a major city not in New England. 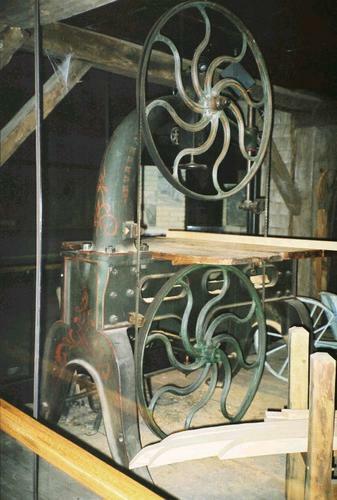 Of the twenty-one saws in the survey thus far, including both four footed cast iron, cast iron wheeled band saws and other early band saws that are not four footed, but are cast iron with , generally, non-cast iron wheels thirteen saws have one or more patent dates cast into them or otherwise strongly associated with them. J.A. Fay & Co. (Haire example) Reissued Aug. 25. 1865, Pat June 16.1868, Sept. 1. Nov. 1. 1871, May 21. 1872, May 19. 1874. This list shows one J.A. Fay & Co. saw (the Haire example) as having both the earliest patent date claim and one of the latest. If this one instance is for the moment discounted—leaving twelve saws—the chronological division of the saws also shows geographical division, as the first seven saws are then those from New England and New York and the next six chronologically are those from Philadelphia and Cincinnati. Also, this chronological division shows type division—if the J.A. Fay & Co. saw (the Haire example) listed first is again discounted—as the first five examples (and six of the first seven examples) are of the four footed cast iron, cast iron wheeled—these are all of that type in this list, at the head of this list--and the last five are all of the non-four footed type. These patents are somewhat curiously presented on this saw. First , as already noted is the unique number of claims, three times the amount claimed for any of the other saws in this study. Second, is the claim of a reissued patent, the only instance of this claimed on these saws. Third, the distinction made between the ‘reissued’ claim and the others, which one would think unnecessary. Fourth the curious conjunction of the two 1871 patent claims. There are also further curiosities, to be discussed below. Further research showed that the J.A. Fay & Co had been reissued a patent not on Aug. 25. 1865—as claimed on the saw—but on Aug. 25. 1863, thus two years prior and so two years closer to the expiration of the seventeen year patent protection period. Either purposefully or inadvertently the claim extended on the saw was two years in error. And, also curiously this patent—a reissue of August 25, 1863 for an original patent of May 27, 1862—is claimed for a ‘Guide for Scroll Saws’ that seems to have little to do with band saw mechanisms. Of the eight four footed cast iron, cast iron wheeled band saws we have found latest patent dates of 1868 (2), 1873 (4) and 1874 (1) (with one remaining questionable date). Of the seven saws from the not four footed, and cast iron with non-cast iron wheel group we have found latest patent dates of 1871 (2), 1873 (1), and 1874 (3) with one remaining questionable date. Each group had one early date of latest patent marks –1868 for the first group and 1871 for the second—and then latest patent marks in 1873 and 1874. It is questionable whether these dates are of much significance in determining which type of saw was earliest. Indeed, it should be kept in mind that the patents claimed on these machines varied from design of the entire saw, to the construction of the saw wheels, to the type of blade guide. At least the latter would have little bearing on the dating of the saw types as the guides were about as good in the beginning of their development as they were just shortly later. Though it is far from certain that none of these saws do not actually have a recorded patent date some information may be deduced from this list nonetheless. The geographical distribution of the machines on this list is striking, as five out of the six examples—the exception being the Baxter D. Whitney saw manufactured in Winchendon, Massachusetts—were made in Philadelphia, Pennsylvania. (The Baxter D. Whitney saw is also unique in this group in having a fully cast iron wheel with spiral spokes.) Indeed, within Philadelphia the Atlantic Works shops and the L. Power & Co. shops were only several hundred feet apart (at 23rd & Arch Streets and at 20 South 23rd Street—23rd & Market—respectively) and the Goodell & Waters works were also quite nearby—within short and easy walking distance right over the Schulkyll River at 31st & Chestnut—by 1880. This address was even closer to the other shops than it appears at first as - because of the river in this area of the city - there were no numbered streets between 23rd Street and 30th Streets so that 23rd & Market was one block away and right over a bridge from 30th and Market, and Chestnut is one block South of Market. The Goodell & Waters shops were about two city blocks from the L. Power shops which were approximately two blocks from the Atlantic Works. band saw patents was from June 7, 1870 to May 9, 1871. 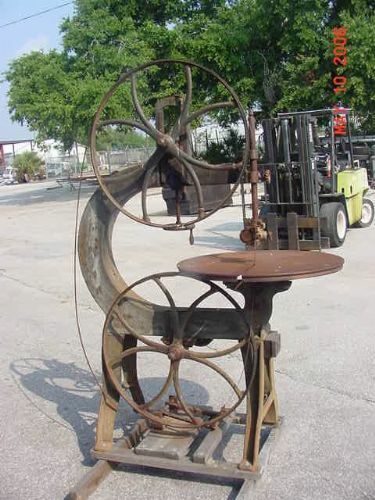 The range of dates for Goodell & Waters band saw patents was from 1883 to 1884. L. Power held a band saw patent from 1885. It may be significant that the Atlantic Works band saw patents date so much earlier than the Goodell & Waters and L. Power band saw patents. Of the other saws in this group of saw that are not four footed, and are cast iron with non-cast iron wheels the J.A. Fay concern held band saw patents dating from 1868 to 1878 (this is discounting the 'reissued patent of 182 and 1863 which is actually for a scroll saw feature and is discussed above) and the Baxter D. Whitney firm held band saw patents dating from 1872 to 1875. It seems that the distribution by date of band saw patents for the five shops that produced machines on our list of band saws that are not four footed, and not cast iron with cast iron wheels falls into two periods, an early and a late, with three firms - Atlantic Works, J.A. Fay, and Baxter D. Whitney—holding patents issued between 1868 and 1878 and the other two firms - Goodell & Waters and L. Power—holding patents issued in 1883 to 1885. Nov. 14, 1871 J.A. Fay William P. McKee? May. 19, 1874 J.A. Fay William P. McKee? A look at this record shows 1), a very substantial set of early patents granted to the non-Philadelphia makers (i.e. J.A. Fay and Baxter D. Whitney) 2), a very early set of patents granted to the Atlantic Works, and 3), a later set of patents—in fact all in the third decades of the 1880’s in this group - granted to the other two Philadelphia makers Goodell & Waters and L. Power. It is interesting to note that one inventor or designer, Louis Pyott, had his work patented for both of the Philadelphia firms of Goodell & Waters and L. Power. John Richards, of course was patentee for inventions and designs held by several firms including J.A Fay and the Atlantic Works, though only the Atlantic Works during this time period. From this it is quite clear that—beyond the immediate question of band saw dates of manufacture—the three Philadelphia firms were begun as business enterprises in a very few years in a quite different time period than the New England and the mid-Western firm. That these three Philadelphia firms started operations at the beginning of the period of the manufacture of the commercially successful band saw machine may be pertinent.